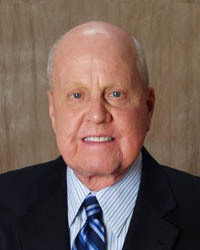 Born in Topeka, Kansas in 1932. Attended Washburn University from 1950 to1953. Transferred to University of Colorado where he graduated with a BS in Business/Marketing and a commission in the USAF. Attended flight school and received his wings in 1955 and was assigned to Ashiya AFB, Japan where he served as a troop carrier pilot until 1957. He continued serving in the USAFR for a total of 23 years of service, retiring as a Colonel. Col. Seal earned a Masters degree in Speech Communications (MS) from the University of Denver. He has owned and operated several businesses, including office furniture, office supplies and commercial printing. He and his late wife have five children, ten grandchildren and three great-grandchildren. He has held offices in the Rotary Club (vice president) the Printing Industry Association (board member), Contract Furnishing Council (president) and has served on the boards of the Veterans Museum and Memorial Center and the Miramar National Cemetery Support Foundation.